My students love 4 Corners games in the classroom! 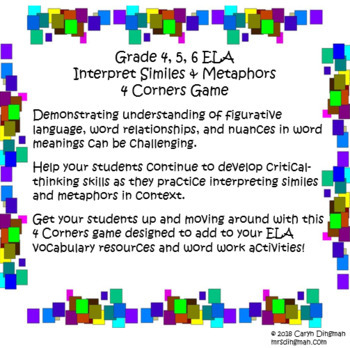 Get your students up and moving around with this game designed to add to your ELA vocabulary resources and word work activities! 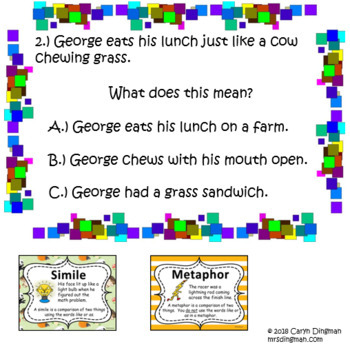 Help your students continue to develop critical-thinking skills as they practice interpreting similes and metaphors in context. Having the explanation poster on each slide and Recording Sheet helped give students visual cues for strategy selection and provided thoughtful conversation starters as we explored why answer choices were made. 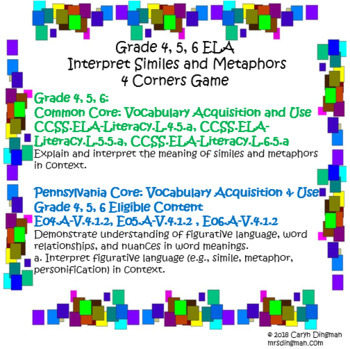 Common Core Grade 4, 5, 6 ELA Literacy Standards are referenced, along with Pennsylvania Core Vocabulary Acquisition and Use Grade 4, 5, 6 Eligible Content correlation. Display the first question slide from my PowerPoint pdf file on your Smartboard. Wait until all students have answered the question, given about 1-2 minutes for each question, and ask them to stand by the letter of the multiple choice answer selected. Students can answer the questions using the Recording Sheet I've included in the product file, scrap paper, individual whiteboards, or printed copies of the PowerPoint slides. Using that 1-2 minute wait time per question, gave a bit more accountability as well; students had to work through the questions rather than going and standing by an alphabet letter with a friend or early finisher. Each of the 12 question slides is followed by an answer slide. 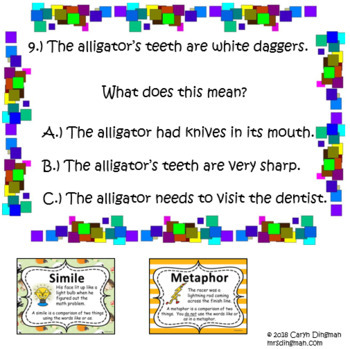 There are 6 simile questions and 6 metaphor questions.